What is particularly attention-grabbing with the table lamp Janko made of natural wood is the simple yet very chic style. 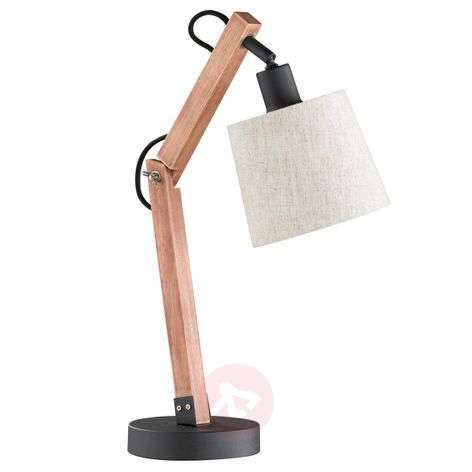 Because of the brown natural wood on the adjustable arm, the light appears somewhat rustic, but the white fabric lampshade casts an elegant touch over all. Additionally, Janko has a firm-standing, black base, completing the overall visual appearance of the table lamp. A unique blend is formed through the different materials and colours, creating wonderful harmony. You can move the light into the desired position, as Janko comes with two flexible joints on the wooden arm. And with the practical cable switch, the light is very simple to operate. Janko is ideal as a reading light and makes any room beautiful.